at the Silver Legacy Resort in Reno! law that economically harms the U.S. beef industry, when consumers are not demanding it in the first place?” The question is especially relevant given potential ramifications associated with the World Trade Organization case filed by Canada and Mexico against COOL. If they continue to win their case – which I believe they will – both nations will undoubtedly retaliate against the United States with an estimated $2 billion dollars in tariffs. These countries have consistently ranked as two of our top export markets and if we lose access to those markets, or they are restricted by the enactments of tariffs, that action will have a profoundly negative impact on all U.S. producers. I closed my testimony with the following statement, “Let me be crystal clear…COOL is all about marketing and has absolutely nothing to do with food safety. Moreover, COOL is not a ‘consumer right to know’ issue. If it were, then COOL would apply to all beef sold and not just the beef sold at the retail level.” Having spent my entire lifetime in the beef industry, there are many lessons I have learned. Perhaps one of the most important of life’s lessons is that you can’t sit on the sidelines and expect your voice to be heard. You must take the opportunity to speak up when the opportunity presents itself. In closing, I would like to thank NCBA, NAMA and CCA for giving me the opportunity to attempt to make a difference for all of us. From the Great Plains to the Pacific Coast, Western Video Market (WVM), based out of Shasta Livestock Auction Yard, Cottonwood, is a confederation of auction yards and bonded livestock dealers representing cattle producers in nearly every western state, where every party in the WVM network is committed to helping each consignor’s cattle bring top dollar. WVM founders Ellington Peek, Cottonwood, and Col. John Rodgers, Visalia, and their dedicated team have spent the last 25 years building the thriving Internet and satellite marketing company into what it is today. With a track record of higher prices and low commission fees, coupled with a repuation for integrity and customer service second-to-none, WVM has had many of its consignors since the first WVM sale in 1989. This month’s cover photo, taken by Holly Foster, features Peek and Mark Foster of Oroville-based Robert Foster Ranch at the Foster Family’s Taylorsville ranch. Foster family patriarch Bob Foster, pictured with Peek here has done business with Peek since the 1950s and is a 14-year consigner to WVM. Foster © WVM invites you to join them at their largest sale of the year, July 13-15 at the Silver Legacy in Reno, Nev. See the ad on page 2 for details. The sale can also be found live at www.wvmcattle.com or on DISH Network. To locate a representative near you, visit www.wvmcattle.com. rs sells at a John Rodge WVM’s ColWVM sale. sPeciAl feeder sAle feATurinG lArGe runs of cAlves And YeArlinGs Also MArk Your cAlendArs! Featuring 500 Fall Calving Cows and HeiFers From reputation outFits! rejoin CCA membership dues. The Top Hand Club recruitment year runs Oct. 1 through Sept. 30. Prizes are awarded every year at CCA’s annual convention. First prize for the Top Hand Program is a custom made saddle, second place receives a custom made hat, while third place receives a custom made knife. This program is open to not LISA PHERIGO only producer members but also our associate members and young members. Last year our Top Hand members helped CCA bring in over $15,000 in dues dollars we might have otherwise never seen. CCA staff is working every day to engage you and keep you up to date with everything that is happening in Sacramento. Each week we send out our Legislative Bulletin and you should be receiving both our Hot Irons Newsletter and this publication monthly. These communications along with our yearly events give you, the CCA member, the opportunity to stay informed about industry news and to get involved. We hope to see many of you later this month for the 36th annual Steak and Eggs Breakfast at the Sutter Club which will be held in conjunction with our Midyear Year Meeting at the Doubletree in Sacramento. Your participation in both of these events is critically important, as these forums provide a priceless opportunity to share your opinions and concerns about the current and future state of ranching in California. I look forward to continuing to work with each and every one of you. If a question arises regarding membership, insurance, finances or events please do not hesitate to call the office at (916) 444-0845 or email me directly at lisa@ calcattlemen.org. introduction in January, and amendments made to the bill in April only served to make the bill less acceptable to the cattle industry. AB 1437 would have prohibited livestock producers from using medically important antimicrobials for the purpose of preventing disease in livestock, only permitting their application after an animal had taken ill, a clear concern for animal welfare. This restriction was a significant departure from the Food and Drug Administration (FDA)’s Guidance for Industry #213, which listed disease prevention as a permissible therapeutic use of medically important antimicrobials. The bill’s reporting requirements aimed at slaughterhouses were also a major concern. The bill would have required that slaughterhouses track and report any history of antibiotic use in livestock products sold in California, a cumbersome requirement made enormously difficult by the national and international nature of cattle trade. Additionally, there was significant concern that AB 1437 would have violated federal law, which prohibits states from regulating federally-inspected slaughter facilities beyond what is required by federal law. Given these significant concerns, CCA strongly and vocally opposed AB 1437, and was pleased that the bill’s author chose to withdraw the legislation. While opposed to AB 1437, CCA actively supports Sen. Jerry Hill’s Senate Bill (SB) 835, a much less restrictive bill which would prevent administration of antibiotics for production purposed such as growth promotion and feed efficiency, but which ensures ranchers’ right to provide antibiotics to their livestock for the prevention of disease. Assembly member Mullin has suggested that he may introduce legislation similar to AB 1437 in the future. CCA will continue to monitor this important issue at both the state and national level, and will continue to protect your right to ensure the health of your herd. Please contact Kirk Wilbur in the CCA office with any comments, questions or concerns regarding this issue. with a higher risk of death in beef calves before weaning. The negative effects associated with FPT reach all the way into the feeding period, and are associated with increased treatment costs, reduced weight gain, and increased risk of mortality. The presence of FPT in beef calves in North America has been reported to be between 11 to 33 percent. Why is colostrum intake important for beef calves? As mentioned above inadequate quantity or quality colostrum intake has short and long term implications for beef calves. Colostrum intake influences disease susceptibility and mortality and influences productivity of beef calves. When can the calf absorb the antibodies from the colostrum? The ability of the neonatal calf to absorb antibodies through the gastrointestinal wall declines rapidly after 4 to 6 hours after birth and ceases 24 hours after birth. After this time period the intestinal tract cannot absorb any more large proteins including immunoglobulins. The earlier the beef calf fed/suckles after birth the greater the level of antibody absorption and the greater the protection from disease. Colostrum transfer to the calf is thus a function of quality and quantity of the colostrum in addition to the timing of administration. Therefore the first 24 hours of life are very important for the calf and for the prevention of FPT. How do I know my calf ingested enough colostrum? Beef calves are left to nurse with the dam, so the assessment of the amount of colostrum ingested is challenging. However, if the calf is not up and observed to nurse from the dam, there is concern that the calf is not ingesting enough colostrum and, therefore, at risk for FPT. If you are not sure, you should go ahead and feed the calf with colostrum. Can I test calves for passive transfer? If you experience a high number of diseased calves, it is advised to check their status of their transfer of immunity. Calves are usually tested between 2 and 10 days of age. Your veterinarian can draw a blood sample and either check the total protein or the IgG levels in the blood, which gives an estimation of the immune status of your calves. Which calves are at risk of receiving inadequate amount of colostrum? Lower blood antibody concentrations have been found in calves born during dystocias. Bull calves may be more commonly affected then heifers, but this might indirectly be associated with the fact that bull calves are more commonly born during dystocias. Cold-stressed or wet calves may be reluctant to get up and suckle and, therefore, are at higher risk for FPT. It also has been reported that intestinal absorption of colostral antibodies in these calves is decreased. How much and when should I give colostrum to the beef calf? As a simple rule you want to give the calf colostrum within 2 to 4 hours of life, repeating 10 to 12 hours later. This will ensure that the calf has the best chance to absorb it through the gastrointestinal tract. It is recommended to tube the calf so that it does not habituate to bottle feeding, leaving it with the drive to nurse from the dam. Additionally it will ensure that everything was ingested by the calf. The amount of colostrum given to the calf depends on its weight, as well as the quality of colostrum. A practical rule is to feed 5 to 6 percent of the calf ’s body weight in colostrum per feeding. Example: An 80-pound calf would receive 2 quarts of colostrum per feeding. Can I use colostrum replacement products? Colostrum replacement products (CRP) are given if colostrum from the cow is not available or if is not given due to biosecurity reasons, such as prevention of disease transmission from milk. High quality CRP’s have a minimum of 60 grams of IgG per liter. Superior to CRP is frozen colostrum which can be stored at -18 to -25 degrees Celsius (-13 to 0 degrees Farenheit) to for at least a year without changes in quality. You may be able to purchase frozen colostrum from a local dairy. However be aware that you could potentially transmit diseases, such as Johne’s disease, from one herd to another with this practice. Ritchie waterers are constructed to perform well and take a beating. Not only are they tough, but they are designed to keep working no matter what the conditions. Whatever your needs are, Ritchie has your solution. New Sale Date » Sept 20, 2014! confirmed improved (7 percent) heifer pregnancy rates in crossbred heifers, in addition to an approximately $30 per head increase in net returns to crossbred calves in a vertically coordinated beef marketing system (http://www.hereford. org/static/files/HarrisHeterosisReport.pdf). Heterosis is routinely exploited in other animal protein (e.g. poultry, swine) and agricultural (e.g. hybrid corn) industries, and there is little doubt that when employed in commercial beef production its use will continue to provide a heterotic boost, especially to important maternal traits (e.g. reproduction and longevity) in crossbred cows. It’s officially been 25 years since well-known California cattle marketeers, Col. John Rodgers and Ellington Peek came together with a common vision – a vision that they both foresaw as evolving the way cattle were sold for California beef producers and others throughout the West. That’s not to say the idea to start a video sale company was a spur-of-the-moment decision. In fact, both Rodgers and Peek had held video sales before, both on their own and together, and the idea of a company dedicated to satellite marketing seemed far-fetched – both to some cattle producers and to Rodgers and Peek. The formation of the video sale company was a long time in the making. In 1989, the pair, with some persuasion from family and friends decided to take the plunge into the satellite marketing business. him. My dad said, ‘You’ve been good to me, I’m going to try it.’ It’s been good to us ever since.” Rodgers said early on, getting large ranches to commit to selling on the video was an uphill battle, but as time went on, ranchers both big and small, began to see the advantages of selling their cattle to a nationwide buyer base. According to Peek, there will always be some skeptics when any new idea arises, but once he explained the process and explained the benefits of having a bigger selection of buyers, the choice for producers seemed simple. As the questions got answered and more consignors got on board with the WVM business model, the consignment process got more and more smooth. It’s also made producers more savvy. “Today, most of our sellers are well informed as to what they need to do to ensure their cattle sell to their best advantage,” Rodgers said, “Consignors today have a better understanding of the importance of complete vaccination programs and value added programs, such as natural, NHTC and age and sourced. These are just a few ways that sellers can add value to their consignments.” Byrne said genetics is another way that WVM has influenced ranchers. Cattlemen and women are paying more attention to the profitability of certain niche markets and how they can make their product fit what the consumer wants. “If you want the premiums you have to invest in value-added programs,” Byrne said. “There is a wide range of categories you can fit cattle into and luckily for us, there is a market for all of them. You just have to analyze which programs will work on your operation and which won’t.” Rodgers echoed Byrne’s sentiment saying sellers who have a good understanding of genetics and use better quality bulls are more rewarded today than ever before. “We have niche programs today such as grass-fed, organic,and Global Animal Practices (GAP). At this time, cattle that are GAP certified are fetching a pretty good premium,” Rodgers said. WVM hasn’t just changed the philosophies and practices of ranchers. As it has grown, it has attracted more buyers and turned into a series of large productions throughout the year. Today, the events are bigger, longer and cover more cattle ground. “We see a lot more cattle and a lot bigger audience at our videos that are held in special locations,” Rodgers said. “Our flag ship video would be the July sale in Reno, but we also really enjoy traveling to Cheyenne, Wyo., and Ogallala, Neb. We make a lot of good contacts with consignors and buyers through these events. “ As a thriving business that continues to grow, Rodgers and Peek are still all-hands-on-deck and play integral roles in the operation. Peek’s children, Brad Peek, Callie Wood and Laurie Norene, each have respective duties at both WVM and Shasta Livestock as well. Ellington Peek calls in a bid during a WVM sale. Brad Peek taking phone bids during a WVM sale. THURS., SEPT. 11, 2014 COLUSA FAIRGROUNDS, COLUSA, CA 1 P.M.
220 West 20th Ave. San Mateo, CA 94403 Doug G. Winnett dwinnett@andreini.com (800) 969-2522, (650) 573-1111 www.andreini.com See our ad on page 17. Representatives: Aaron Tattersall	aaron.tattersal@cropins.net • 303.854-7016 Jim Vann jimv@wsrins.com • 530.218-3379 Matt Griffith mathewdgriffith@hotmail.com • 530.570-3333 Dan VanVuren danv@garibaldiins.com • 209.484-5578 Tait Berlier tait.berlier@cropins.net • 303.859-0777 See our ad on page 17. Silveus is CCA’s exclusive partner for PRF Insurance! Todd Renfew, Broker/Owner, (707) 455-4444 info@caoutdoorproperties.com • www.californiaoutdoorproperties.com See our ad on page 33. .
Find virtual tour and additional information on all of our properties at www.craterlakerealtyinc.com Linda Long, Principal Broker/Owner, (541) 891-5562 Junction of Hwy 62 and 97 • P.O. Box 489, Chiloquin, OR 97624 info@caoutdoorproperties.com • www.californiaoutdoorproperties.com .See our ad on page 31. Five Star Land Company As ranchers, no one know what you do like we do. Hire a cattlemen to get the job done! See ad on page 32 or visit www.clarkcompany.com to view listings. Livestock Watering Systems that will work for you. 120 S Main P.O. Box 730 Conrad, Iowa 50621 Visit www.ritchiefount.com to find a dealer near you. DONATI RANCH, Oroville • (530) 693-1634 (530) 693-1640 • www.donatiranch.com O’CONNELL RANCH, Colusa • (530) 458-4491 www.oconnellranch.com • ocrnch@frontiernet.net WULFF BROTHERS LIVESTOCK, Woodland (916) 417-4199 BROKEN BOX RANCH, Williams • (530) 473-2830 www.brokenboxranch.com • maltby@citlink.net See ad on page 20. From generation to generation, we’ve been here, committed to agriculture — and you — for 95 years. And counting. BULLSEYE Breeders GONSALVES RANCH, Modesto • (209) 765-1142 FLOOD BROS. CATTLE, Oroville • (530) 534-7211 DIAMOND OAK CATTLE CO, Merced (209) 383-4373-4491 DOUBLE M RANCH, Bothwell, Utah • (435) 854-3770 AZEVEDO LIVESTOCK, Newman • (209) 837-4664 See ad on page 29. Call 800.800.4865 today Or visit AgLoan.com STOCKTON • OAKDALE • TURLOCK • MERCED Part of the Farm Credit System. Equal Opportunity Lender. P.O. Box 713, Red Bluff, CA 96080 Dan Byrd (530) 736-8470 Ty Byrd (530) 200-4054 www.byrdcattleco.com byrdcattleco@hotmail.com See ads on pages 46 and 56. AMADOR ANGUS, Modesto • (209) 538-4597 SCHAFER RANCH, Orland • (530) 865-3706 J/V ANGUS, Winters • (530) 795-2121 See ad on page 15. Tim and Jill Curran (209) 765-1815 1000 Cook Rd., Ione, CA 95640 cirecleranch@volcano.net www.circleranch.net See ads on page 41. 4064 Dodds Road, Oakdale, CA 95361 Ray and Mary Alger (209) 847-0187 Brent Alger (209) 988-2567 raymarranches@velocity.net www.raymarranches.com See ad on page 7. Gonsalves Ranch 7243 Maze Blvd., Modesto, CA 95358 Joey and Kristy . (209) 765-1142 Mike and Stacy (. 209) 531-4893 Joe and Debbie . (209) 523-5826t See ads on page 41. P.O. Box 367, New Cuyama, CA 93254 Daniel and Pamela Doiron. (805) 245-0434 www.spanishranch.net See ads on page 45. P.O. Box 558, Cottonwood, CA 96022 • (530) 527-3793 Ellington Peek ........................	������������������������������������������������� (530) 527-3600 John Rodgers .........................	��������������������������������������������������(559) 730-3311 Brad Peek ..................................................... ..........................(530) 347- 3793 Visit www.wvmcattle.com or see ad on page 2. Escalon Livestock Market 25525 Lone Tree Rd, Escalon, CA 95320 (209) 838-7011 • www.escalonlivestockmarket.com • escalonlivestockmarket@yahoo.com. Sales every Monday. See our ad on page 14.
success and growth of your operation. This relationship is built not just on the numbers in your financial statements, but also on mutual trust, a thorough understanding of your operation by the bank, and your thorough understanding of your banks expectations. A good bank and a good banker don’t just want your deal, they want your relationship. The stronger this relationship, the better it will ultimately be for you as a customer of the bank in the form of expedited service, less stress and less frustration. difference in getting a loan or not. If you’d like to understand more about you financial statements ask you banker or your CPA. We read these things almost every day. Efforts are now underway by the United States Department of Agriculture (USDA) Farm Services Agency (FSA) to enroll eligible ranchers for disaster relief under the Livestock Forage Program (LFP) and Livestock Indemnity Program (LIP). Producers can visit their local FSA county offices now to further discuss eligibility requirements. Generally speaking, producers with an average annual adjusted gross income of less than $900,000 for the last three tax years, including non-farm income, are eligible to receive combined payments from LFP, LIP and the Emergency Assistance for Livestock, Honey Bees and Farm Raised Fish Program, up to $125,000 per crop year. Payments made under LFP are calculated based on drought severity determined by the U.S. Drought Monitor administered by the University of Nebraska, Lincoln. Producers can determine their county’s eligibility by visiting their local FSA office or visiting http:// droughtmonitor.unl.edu/fsa/Home. aspx. The loss of forage on federal lands to drought and fire are also eligible events under LFP, although it falls under a different payment formula. Producers are eligible for payments under LIP for the death of livestock associated with adverse weather, fire, natural disasters and attacks by wildlife reintroduced by the federal government. LIP will refund producers up to 75 percent of the market value of the animal at the time of loss. Congress authorized payments from both programs to be retroactive back to Oct. 11, 2011. Producers will be required to provide records demonstrating livestock death and forage loss in order to receive payments under either program. Producers have three to nine months to apply, depending on the program and the loss that has occurred. All California counties are eligible as primary or contiguous counties for previously-announced 2014 drought disaster assistance from the Farm Service Agency (FSA). All qualified farm operators are eligible to apply for low-interest FSA emergency loans. losses associated with natural disasters. USDA’s low-interest emergency loans have helped producers recover from losses due to drought, flooding and other natural disasters for decades and a strong farm safety net is important to sustain the success of agriculture. Additional resources for drought relief can be found by going to the USDA website at www.usda. gov/drought and the California Department of Agriculture website at www.cdfa.ca.gov/drought. Please contact your local FSA office with questions. GW Premium Beef 021TS MCM Top Grade 018X TJ Sharper Image 809U Tool Time ContaCt any of the breeders below to be added to the list to reCeive a Catalog. Real estate experts answer common questions For land owners, the decision to sell property can be exhausting. The time and effort that is invested in improving property is significant, similarly, the time spent with loved ones on a family ranch is invaluable. The steps necessary to sell a ranch or home should not be taken lightly. And, for individuals looking to buy property, there are also many questions they should ask of themselves and those who are assisting them in their needs. Below are some questions we posed to agriculture realtors that may help you if you are considering buying or selling real estate. doing to you property before listing? 112 acres, 93 acres irrigated, large capacity bull and heifer facility. Several calving fields, Hay/livestock barn w/ heated vet room, portable scales and outstanding pipe corrals. Incredible mountain views. New 3000 sq. ft. home, 3 bdrm, 2.5 bath, teak floorS, knotty hickory cabinets, granite countertops, marble showers, stainless appliances, juniper mantle and fantastic decks. MLS 82972 $1,250,000 Please contact M.T. Anderson, 541-377-0030, MTAnderson@CraterLakeRealtyInc.com for a private tour. Visit our website to learn more about this multidimensional ranch! Looking to buy or sell ag real estate in California? Look no further than Five Star Land Company. The principles have over 150 years in California agriculture. As a past CCA President and a past Young Cattlemen’s President, no one knows what you do like we do. Put cattlemen to work for you! accomplishments, as well. 4. Obtain a transcript. Clarify whether it needs to be an official or unofficial transcript. Official transcripts usually have a cost associated with them and come from your school’s administration office. If an official transcript is not required, then you may send an unofficial transcript from a student portal or other student website. After putting together your application, make sure you have everything that needs to be included. Try to send the application in a week prior to the deadline, so it is received on time. If you are cutting it close, then make sure to get it post marked, so the committee will know you summited it on time. Remember everything in your application should look tidy and professional! The appearance of the application is the first thing that the selection committee will know about you. If you are selected as a possible candidate for the scholarship, you may be interviewed by a scholarship committee. Prepare for the interview beforehand. Refer to the side bar for more information on interviews. If you receive a scholarship you may be asked to attend some sort of lunch or dinner to receive your award. If so, you should dress professional and act accordingly at the function. Also, don’t forget that the California Cattlemen’s Association Young Cattlemen’s Scholarship is now available online at www. calcattlemen.org. Download the application and return in full to the CCA office by Sept. 12, 2014. If you have questions contact YCC advisor Malorie Bankhead in the CCA office at (916) 444-0845. Tips for Acing a Scholarship Interview Dress to impress. Shake hands before and after. Prepare your knowledge of the organization. Review your application. Thank the interview panel. made progress in maternal calving ease and stayability while continuing to improve our growth and performance traits. Simmental cattle are known for producing desirable yield grade scores but we have also made huge progress in the marbling ability of our cattle (from -0.12 in 1993 to 0.12 in 2013). For those of you who are more visual thinkers, here are two graphs to illustrate Simmental genetics are moving in the right direction. In Figure 1, you can see changes in a number of important traits in purebred Simmentals born in 1994 to 2013. Please note, the graph is not in actual EPD units. Rather, each trait has been standardized (divided by the standard deviation and set the 1994 EPD value to zero) so comparisons of relative changes among the nine EPDs can be made. Again, you can see that Simmental cattle have made improvements in each of these traits over the last 20 years especially in marbling and calving ease. The selection pressure in these economically relevant traits is reflected in the increase in the selection indices (API and TI; Figure 2) over the same time period. The average API has grown from roughly $58 to $118/exposure. While TI has not increased as sharply as API, TI has still improved from roughly $53 to $68/exposure in the last 20 years. This translates to an increase of $60.40 and $14.80 per cow exposed for API and TI, respectively. The time is here to sell our story. These data showcase the high-quality genetics Simmental cattle have to offer. The industry is looking to expand and Simmental breeders, through wise selection, have built a product that can improve the efficiency, meat quality, and profitability of beef production. Simmental breeders should be proud of the progress they have made over the last 20 years. Keep up the good work! Genetic improvement in the average EPD of purebredSimmental cattle born in1994 to 2013. The traits have been standardized in order to compare relative change between traits. Change in the average All Purpose Index (API; best if keeping replacement heifers) and Terminal Index (TI; best if all calves will be harvested) in purebred Simmental cattle born in 1993 to 2013.
and yield grade while the Angus steers had increased back fat thickness and marbling scores. Calves from Simmental dams also had increased HCW. Marbling improved in the crossbred steers while all the other carcass traits were not affected by heterosis. There is currently a large feed efficiency trial going on with the collaboration of several research institutions, industry companies, and breed associations (www.beefefficiency.org). This feed efficiency study is collecting DNA, feed intake, growth and carcass data on 8,000 head of cattle from eight main beef breeds in the U.S. Approximately 2,400 cattle will be genotyped and used to develop molecular breeding values for feed efficiency, growth and carcass traits. As feed intake is such a difficult and expensive trait to measure, researchers will investigate DNA markers that may estimate efficiency more readily than measuring efficiency directly. Information gained on the genetic control of feed efficiency from such a large scale project could have a huge economic value to the U. S. beef industry. One of the researchers, Bob Weaber, Ph.D., of Kansas State University, estimated that a 2-pound improvement in RFI would save the U.S. beef industry nearly 1.2 billion dollars in one year. While the trial by Retallick and her colleagues has relatively few animal numbers, the findings support a role in improved feed efficiency in crossbred (SimAngusTM) beef cattle compared to the purebred steers. Hybrid vigor has long been known to boost performance in growth traits. It is interesting to discover that it may also increase feed efficiency in crossbred animals. In times of high feed costs and an increased need for sustainable agriculture, the importance of understanding the genetic control of feed efficiency canâ&#x20AC;&#x2122;t be overemphasized. The potential for selecting more efficient animals with the knowledge gained from the feed efficiency study could have large economic impact on the beef industry (a 1 percent increase in efficiency has the equivalent economic impact as a 3-pound increase in rate of gain). It will be interesting and important to follow future reports from these and other researchers digging into the genetic control of feed efficiency in beef cattle and the role heterosis plays in improving this economically important production trait. To do business with those looking out for you! Silveus is the exclusive PRF partner of CCA. When it comes to PRF (Pasture, Rangeland, Forage), thereâ&#x20AC;&#x2122;s no one better! Mark your calendar for Sept. 17, • Oakdale, CA! landscape plants. All of that beef talk made everyone hungry, and the meeting concluded with a delicious beef dinner. Steve Dunckel, Delhi, (209) 484-0152 Carole Guertin, Lincoln, (916) 645-8500 Carolyn Carson, Oroville, (530) 693-0906 Visit us online for membership applications, ucoming events and cattle for sale. Looking to Jumpstart Your Cowherd? Our genetics will produce superior black-hided calves that will top the market. Like many of you, drought conditions have forced us to keep only our best cattle and make smart breeding decisions when it comes to producing seedstock loaded with predictability, muscle and marbling. To find out more, visit www.spanishranch.net. Your Source for Brangus, Angus and Ultrablack Genetics in the West mostly Brangus females. All the cattle were managed, fed and harvested the same. Warner-Bratzler analysis indicated that 97 percent of the Brangus steaks were scored “tender” or better whereas only 94 percent of the Angus steaks scored tender. Use of genetic evaluation technologies, performance and pedigree tracking software as well as genomics has continued to move Brangus cattle to the forefront of the beef industry. “Incorporation of Total Herd Reporting (THR) has empowered the Brangus database and ultimately our genetic evaluation,” Perkins said. “IBBA has always been a leader in genetic evaluation technology, and its recent adoption of multi-breed EPD methodology is no different. These genetic selection tools offer producers necessary information for making sound genetic decisions while hitting marketing goals.” As a commercial bull buyer, consider what the Brangus breed can do for your bottom line. It is IBBA’s belief that producers making the best genetic decisions today will see the most opportunities for profit in the next decade. Please do not hesitate to call 210-696-8231 or go to IBBA’s website at www.GoBrangus.com for additional information. Williams recognized as VCCA Cattleman of the Year The Ventura County Cattlemen’s Association recently recognized Mike Williams as their 2014 Cattleman of the Year. The award was presented at the annual Spring Barbeque held at the RA Ranch in Ventura. The award, which was presented before an audience of more than 150 members and guests, consisted of a plaque along with a new Stetson cowboy hat. Williams resides in Acton with his wife Linda and they operate a ranch just outside Ventura. Their primary focus is a cow-calf operation which is subsidized by seasonal stockers. Along with other valuable contributions to the association, Mike has been a leader in the Ventura River Watershed project, spending hours researching information on total mass daily loads (TMDLs). In addition to being heavily involved in promoting beef quality assurance and beef production on the local level, Williams is also involved on the state level, as he is currently a member of the California Beef Council, based in Sacramento, and is vice chairman of CCA’s Agriculture and Food Policy Committee. got News? 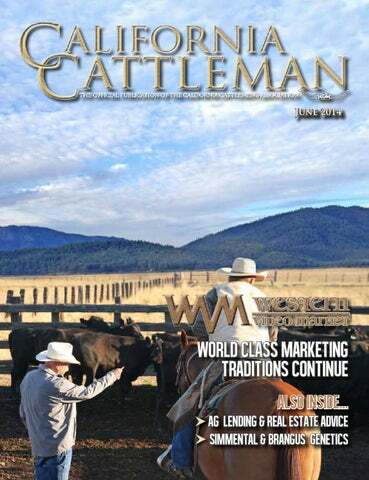 The California Cattlemen’s Association and the California Cattleman magazine wants to share your local news with beef producers throughout the West! If you have news you want to share, send it by e-mail to californiacattleman@gmail.com or call us at (916) 444-0845.
at the Cal Poly Bull Test. In recent years, Stone also enjoyed hosting visitors at the ranch. A graduate of Class I of the California Agricultural Leadership Program, Hank served on numerous statewide boards including the California Cattlemen’s Association, and the California FFA Foundation. He was Past President of both the Yolo County Cattlemen’s & Woolgrowers Assn., and the California Beef Cattle Improvement Association (CBCIA). He served on many local boards and was also an advisor for both the UC Davis and Cal Poly Animal Science Departments. He was named Commercial Producer of the Year by CBCIA, and also received their Horizons Award. In 2008, he was named the California Livestock Man of the Year by the California Chamber of Commerce, presented at the Cow Palace Grand National Rodeo. Well-known as an auctioneer, Stone offered his self-taught skills at over a dozen different Junior Livestock auctions in Northern California, including the Yolo County Spring Show and Yolo County Fair. Over a 40-year span, he sold thousands of 4-H and FFA animals, and continued to auction at charity events after he retired. Stone’s family is setting up a memorial fund with the Yolo County Fair, to pay for improvements to the livestock auction building. Tax-deductible donations can be made to: Yolo County Heritage Foundation, c/o Henry Stone Livestock Facilities Fund, 1125 East St., Woodland, CA 95776. Donations can also be made to the California Rangeland Trust, 1225 H Street, Sacramento, CA 95814. Hank is survived by his wife Suzanne, sons Scott and Casey, their wives Karen and Angela, and grandchildren; Austin, Carson, Keeley, and Wilson. He was preceded in death by his parents, Carol and Marea Stone, his stepmother Georgie, and his oldest son David. A celebration of Hank’s life was held on May 30, , at the Yolo land & Cattle Co. ranch headquarters near Esparto. WEdding Bells Lohse and Danekas Matthew Lohse and Mercedes Danekas were married February 22, 2014, at Ironstone Vineyards in Murphy’s California. Matthew is the son of August and Donna Lohse of Orland and Mercedes is the daughter of James and Sherry Danekas of Wilton. The bride is a graduate of the University of California, Davis and works with her family at JDA, Inc. publishing the Western Cowman magazine and working within the beef industry. The groom is a graduate of Cal Poly, San Luis Obispo and manages vineyards in the Delta and Lodi regions. The newlyweds reside in Wilton. Does youR seedstock supplieR... • Provide you with 50K DNA data on every bull? • Provide you with Residual Feed Intake (true efficiency) data on every bull? • Provide you with the BI Range-Ready Warranty™ – a $3,500 value FREE TO YOU! • Provide you with marketing assistance on your calves? Dan 530-736-8470 • Ty 530-200-4054 byrdcattleco@hotmail.com • www.byrdcattleco.com The West’s #1 Source for Low Birth, High Growth Bulls with Marbling, Muscle and Feed Efficiency!